Every October, our feeds are sprinkled with fun and festive ideas for Halloween from some of our favorite influencers. This year we couldn’t help but highlight a few of our favorite trends. It wouldn’t be Halloween without the search for a clever costume, so why not get the whole family involved? Luckily there are some creative and original family costume ideas floating around the blogosphere. Studiodiy blogger Kelly Mindell has the family Halloween costume concept down to a science. She’s been sharing colorful and fresh costume ideas with her followers all month long. We’re also taking notes from Patti Schmidt, who likes to include her precious daughter in her Halloween fun. We love how she can give even a frightening family costume an elegant and feminine twist. We’d say her Wizard of Oz family ensemble took the concept to new heights. While we could look at photos of adorable babies in coordinating costumes with their parents all day, it’s important to note that a “family Halloween costume” is not only reserved for parents of young children. We love lifestyle blogger Aimee Rancer’s idea of a subtle twinning Halloween look with her pup. Pumpkins are used for all sorts of Halloween activities, but we are particularly fond of the creative pumpkin home decor trend. If you look at her recent posts, you may think lifestyle blogger Anastasiya Yurinok is some sort of Pumpkin Queen. Her enthusiasm for this decorative accent and the spirit of the pumpkin patch hunt is contagious and has us eager to try out all of her local recommendations. Sonoma County lifestyle and fashion maven Erika Altes has a unique and elegantly subdued approach to pumpkin decorating. Hues of white and pink pumpkins give her home decor a light and airy feel. Once again, DIY expert Kelly Mindell has brought her A-game with colorful inspiration for Halloween decorating, including a whole lot of pumpkins and a little help from her adorable son. Last but certainly not least, Halloween would not be the same without seasonal spices, recipes and treats! Certified Sommelier and blogger Samantha Capaldi continues to inspire our recipe books and evening get-togethers with favorites like this Pumpkin Spiced Martini and other seasonal food and wine pairings. Vegan food blogger and recipe developer Bo of Bo’s Kitchen recently shared some ideas for pumpkin-spiced and seasonal squash recipes in the form of visual masterpieces that make us want to crawl right in and cozy up with a warm bowl of autumnal bliss. Vegetarian recipe creator and adventure blogger Shelly Westerhausen is clearly also a fan of fall-inspired treats. 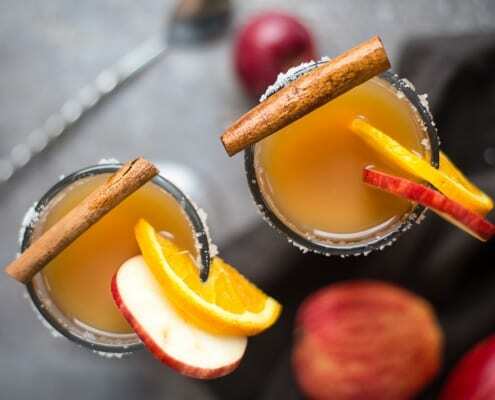 This month, she shared a recipe for a Chai-Spiced Apple Cider cocktail that we think could be the perfect seasonal touch to an intimate Halloween soirée. What creative Halloween ideas have gotten you inspired this year? Comment below with some of your favorites. Sophia Flores-Istin is a social media specialist with a passion for all things wine and travel, which has taken her across the globe and through some of the world’s finest wine regions. Upon returning to her home in Sonoma Wine Country, Sophia jumped right into the front lines of the local wine industry. Her experience in wine sales and hospitality exposed her to a wide array of wines and introduced her to marketing strategies in the wine business. She’s thrilled to join McCue as a storyteller and digital content creator, and continues to be a passionate traveler and language learner. Her next language: German!